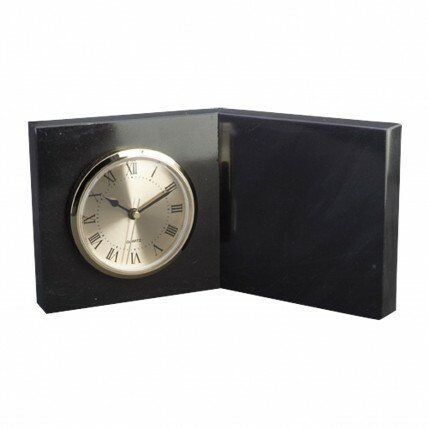 Our stunning Black Marble Book Clock makes an impressive gift for someone special! This heavy, jet black marble clock features an open book design. On the left is a golden clock with black hands; on the right is your personalized message etched on a black brass plate. With free engraving, include your organization logo and a heartfelt message! Stands 5" tall. ***Note: Product color may vary slightly from photo due to natural variations in the marble. ***Note: this product is currently out of stock..
Production time for this product is 31 business day(s); expected pickup or shipping date is 06-05-2019.